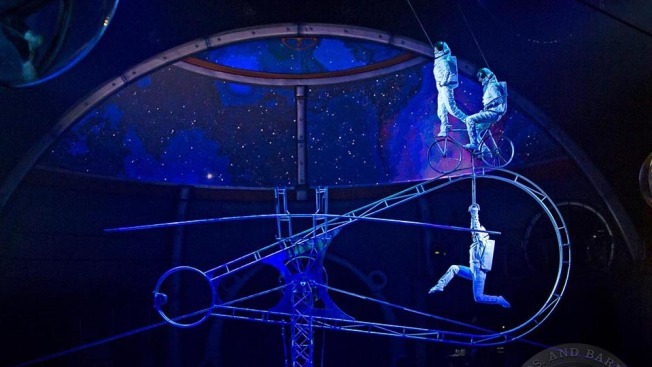 Making its U.S. debut, the Simet Wheel (above) requires incredible balance and artistry, which performers demonstrate as astronauts exploring the galaxy. The following content is created in consultation with Ringling Bros. and Barnum & Bailey. It does not reflect the work or opinions of NBC Chicago's editorial staff. To learn more about Ringling Bros. and Barnum & Bailey's Out of This World, visit Ringling.com. Turns out there’s been some big changes under the big top, folks. That’s because Ringling Bros. and Barnum & Bailey has completely reimagined the modern circus experience with their boldest production ever, Out of This World. Get ready for state-of-the-art visual effects, a seamless flow of breathtaking, never-before-seen performances and — for the first time ever — a character-driven storyline. Even better news? It’s all coming right here to Chicago this November. From November 4-13, Out of This World will have performances at the Allstate Arena in Rosemont before moving to Chicago’s United Center for a November 17-27 run. Tickets start at $20 and are available through Ticketmaster and the Allstate Arena and United Center box offices, by calling (800) 745-3000, or visiting Ringling.com. So what kind of spectacle can you and your family expect? Audiences will be transported into space on an intergalactic journey that involves everything from acrobatic astronauts and ice skaters to lions and tigers, while seven high-resolution projectors create a multitude of immersive, intergalactic worlds. Watch the Simet Wheel performers embark on a gravity-defying spacewalk, marvel at China’s stilt-skating Heilongjiang Provincial Acrobatic Troupe Co. Ltd., and cheer as Ringmaster Johnathan Lee Iverson and Starseeker Paulo dos Santos battle evil Queen Tatiana on a mission to rescue the greatest and most talented circus stars. But there’s just as much going on behind the scenes at this reimagined circus. Out of This World features innovative new tech like the spot-light tracking system, which uses infrared-equipped costumes to keep all the acrobatic performers in focus. In fact, there’s tech for you too. The free, all-new Ringling Bros. mobile app helps keep families connected before, during and after the show. It also allows fans to customize and share memories on social media, as well as unlock exclusive content during Starseeker’s Early Access™, a free pre-show interactive experience. Ready to discover the reimagined circus? Get your family’s tickets to Out of This World right here.